Arguably the most successful black politician in Seattle history, Ron Sims has been pulled over eight times by the police. I have been pulled over exactly zero times. Recently I was talking with Ron Sims, the former King County executive, about unequal discipline in the schools. He mentioned almost in passing that while driving around the city he has been pulled over by police eight times. Sims told me this in April and since then, I think of it often. 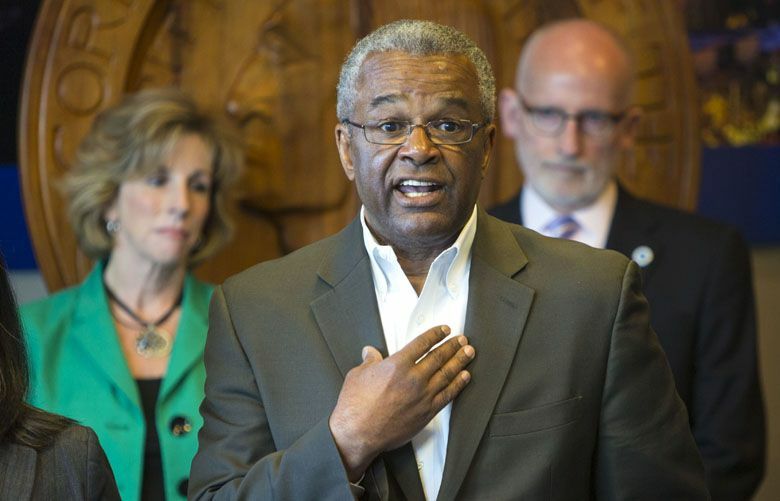 He’s an ordained Baptist minister, was the longest-serving King County executive ever (1996-2009) and is now a Washington State University regent. He’s arguably the most successful black politician in Seattle history, as well as a pillar volunteer in the community. Yet he’s been pulled over eight times. I have never been pulled over in the city. I drove around for years in a 30-year-old Volvo with a muffler tied on with a coat hanger and red tape for a taillight. Never pulled over once. Sims didn’t get any tickets — at 68 he jokes he’s “too old to speed.” Obviously he never had any serious trouble during these stops or this would have been headline news long ago. But with the country seemingly on the verge of breaking apart, again, over issues of race and unequal treatment, I think of Sims now on an almost daily basis. We’ve been talking about unequal traffic stops for decades. The phrase “driving while black” was big way back in the 1980s. Yet here we still are. Ron Sims: 8. Me: 0. It’s depressing because it’s another tiny example of how intractable these issues are in America. I’m a child of the 1970s, born the year after the Civil Rights Act passed and raised with the promise that racial integration was on its way, as surely as spring. But integration didn’t come. Equality didn’t follow. Fifty years of well-meaning effort came with some successes, but broadly seem to have gotten us next to nowhere. The government-sponsored efforts definitely had a checkered history. Busing led to white flight. Affirmative action got struck down. The fair-housing laws were successful, but have been swamped by gentrifying economic forces. So though we’re diversifying rapidly by the numbers, we remain apart. Same city, different rules. Often different worlds. Some people believe integration failed because we didn’t really want it. “We’re ignoring the immutable core issue: much of white and wealthy America is perfectly happy with segregated schools,” wrote Washington state’s 2016 Teacher of the Year, Nate Bowling of Tacoma, in an essay a few months back that went viral on the internet. “Perfectly happy” seems unfair. But it’s true that the goal of integrating lost its urgency along the way. To rephrase Bowling’s point, the “haves” of society are doing just fine without it. We’re not the ones being pulled over. So what to do? The news makes it feel hopeless, but we are in year four of a police reform effort in Seattle, precisely to reduce the chances of the types of violent interactions we all saw on video this week. Right now in Seattle there are also initiatives under way centered on schools and affordable housing, both imperfect but both designed to nudge us toward going to class and living on the same blocks. One of the efforts is at my kids’ high school, Garfield, where the advanced ninth- grade language-arts and history classes are being converted to “Honors for All.” The premise is to end the test-based “tracking” that has resulted in whites and Asians mostly in one class, and blacks and Latinos mostly in another. I don’t know if putting all different learning levels into one class will work. The Lake Wobegon-style nickname gives me pause. But we’ve also got to try to go to class together. We can’t stay in silos and simply hope the cultural misunderstandings and racial animus marring the country dissipate on their own. If integration had worked better, would traffic stops still sometimes boil over into violence? Would the achievement gap be as big? Would Ron Sims still get pulled over more than me? Perhaps. But it’s still the answer. Despite 50 years of society trying and mostly failing, integration’s the only answer I’ve got for you. We either figure out how to grow up together or we go down apart: We choose.